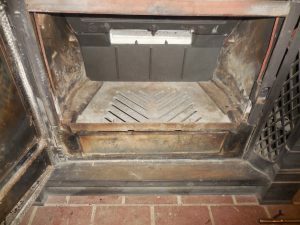 As the 2018 heating season began it became painfully obvious that our 30 year old Vermont Castings WinterWarm 2100 was having problems with the damper. Now looking back it was having damper problems several years before this. 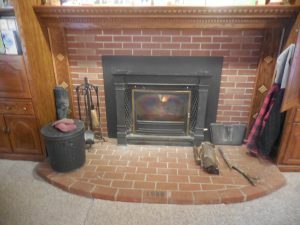 The damper was not seating across its length. I tried using fatter gasketing, but the gap on its left was still too wide. Besides that it was binding when opening and closing. My solution as always was a little more force. 🙂 Needless to say this lasted until we couldn’t get the damper opened or closed. Over the past month I’ve learned a ton about the workings of this unit and didn’t find anything directly applicable on YouTube, so this blog may be helpful to some poor soul freezing it out somewhere. My early experience includes disassembling the throats, lower fireback and the ash grate to replace the catalytic converter and refractory assembly (very pricey, indeed!) I managed to break the upper sides of the refractory box working to install it without taking out the upper fireback first (much more on the upper fireback below). 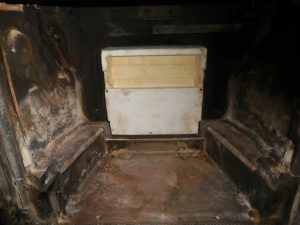 Some gasket cement fixed this problem mostly since the back panel was still intact. Anyway, after I let the unit cool down I crawled inside to see how to get at the damper arm. Actually I first thought I could pull the whole shebang out a bit and access the damper arm linkage, which I figured might be the problem. Of course that wouldn’t work unless one disconnects the chimney adapter, which is above the damper, which in turn is above the upper fireback. So after removing the ash fettle, ash grate, ash bin, the refractory box, both throats and the lower fireback (there is one nut to remove from the throat clamp that holds all of this together) then laying on my back I peered into things. The base problem was that the upper fireback, into which the damper closes, was severely warped on its left. I wasn’t sure about the damper itself, but the upper fireback needed to be replaced. 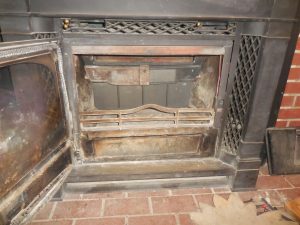 This piece, which includes the damper door and is thus VERY heavy is held in by 2 – 7/16″ head bolts with flat square nuts that fit into slots in the stove frame on each side. With a bit of PB Blaster and waiting overnight these came out easily enough. 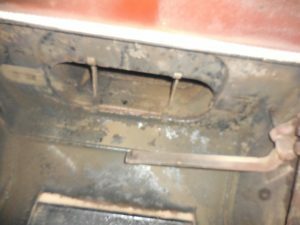 But my discovery was that the door air manifold that sits in front of the upper fireback needed to come out first. This is held with one bolt on its left and a gasketed slot on its right. It is also heavy. OK, so the disassembly was complete. the old upper upper fireback with damper removed. As we say around here, “Just a little bit warped”. The next thing I wanted to look at was the damper control arm. It was puzzling that it was slipping on the vertical shaft that went back to the front damper control on the unit. I tightened the 7/16″ head bolt in the bottom to snug it up but with no effect. So off it came and as I had guessed at about the same time it had a pin through the shaft, or rather, it used to have a pin that had sheared off sometime ago and in fact was completely missing. I had probably vacuumed up its remains during my annual cleaning in a previous year. So there you go. These findings pretty much answered the damper operation question. And I was painfully aware that I had been running it with the damper effectively cracked open for maybe 5 years, with the resulting poor efficiency. Arrgh. I ordered the upper fireback, a new refractory box and bought a new damper (just in case it was also warped) that they had in stock . I kept my self calm reminding me of all the money I had saved over 30 years (minus the last 5 to a lesser degree). I also got a new left throat to replace this warped one. 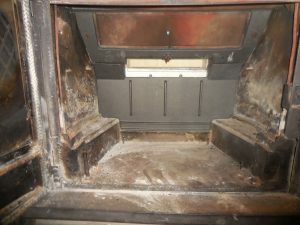 It turned out that the damper door itself was in mint condition, which saved me $41. Altogether these set me back $380. Add in a broken lower fireback (explained later) an it comes to $454. Cast iron is not too pricey. Calcium silicate refractory board is very pricey. 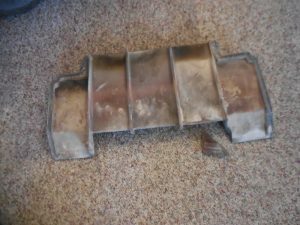 The refractory box was $281 of the $454. There is a whole bunch of stuff no one told me about how this unit goes together, but taking it apart really helps. There is an order to it. First the damper arm. The dealer wanted $6 for the 1″ x 3/16″ diameter damper arm pin. I got a 3/16″ SS bolt at Menard’s for $1.65. Come on, dudes! I trimmed off the bolt to fit and used thread lock on the nut on its threaded end just in case. This pin actually fits in a slot on the top of the arm. So it was easy enough to set the pin thru the shaft and work the arm up to it, then tighten the bottom bolt. I used some Never Seize on the vertical shaft thinking of possible future issues. How it gets engaged with the bracket on the back of the damper is another story later on. Next it was time to assemble the damper on to the upper fireback. 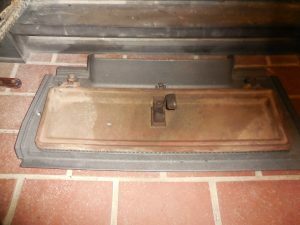 I kept the bolts, washers and tiny hinge plates from the old one (they didn’t come with the new piece – probably do with the damper door itself). Well actually, I twisted off one of the original bolts, managed to extract its remains and replaced it. I mostly straightened the hinge plates and on reassembly flipped them over so that they had a slight downward bend that corresponded to the damper hinges. Next was refurbishing the damper, the damper arm bracket and its adjusting bolt. I disassembled the entire bracket setup. I had guessed that I would need to replace the damper, but when I finally got the new upper fireback I assured myself that the damper door was not warped. Happily the hex head bolt holding the bracket on the damper door came out without issue. The adjustment bolt took some PB Blaster and patience but eventually came out. This bolt I discovered allows one to adjust the damper closure so that the front control lever locks it into place and adjusts for the gasket compression. Cool. 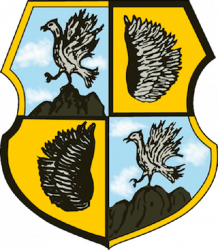 But the old one was in bad shape having been immersed in the flames for 30 years. Even PB Blaster did nothing to loosen its locking nut. So into my parts bin I went for a 5/16″ Phillips head bolt and nut. The old bolt had a shallow point on the end that engages the damper bracket, so I ground one into this new one. I had to re-tap the threaded hole for the threads of this new bolt. 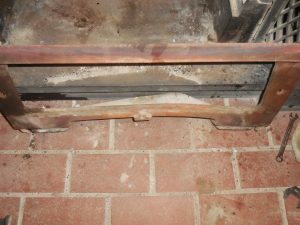 I put the damper into the new upper fireback, complete with the bracket on the chimney side and the adjuster protruding from the stove side. I then happily installed the 3/16″ gasket for the damper into the fireback. It is way easier doing it with gravity on your side removed from its angled position in the stove. After that I forgot to install the 3/16″ gasket into the slot down both edges of the fireback (more later). The refractory box and I were not on friendly terms after my earlier incident. No one told me however, that you just can’t get this thing into the stove without first removing the upper fireback. In the present case, again, the bottom of this piece wouldn’t fit through the opening provided. I took a rasp to it and carefully skimmed off an 1/8″ on each side up far enough to match the high of the short rear wall that retains the lower fireback. OK, didn’t break anything (also don’t mess with calcium silicate, an emphysema causing particulate; I used a high efficiency shop vac to keep thing clean). I decided once the cost of this fix passed $200 that I was going to reuse the converter. It was in pretty good shape. I just flipped it over since it was losing some of the honeycomb from the bottom. Jumping ahead a bit I also ended up using the old refractory front piece for the converter opening because of issues fitting in the new lower fireback. So I was now EPA compliant (they really don’t know much about woodstove density in northern Indiana and its non-impact, but hey, the stove runs slightly more efficient with it installed and I made a living helping companies comply with far more esoteric EPA regulations). As I said above the upper fireback with the damper installed in it is hefty – probably 30#. 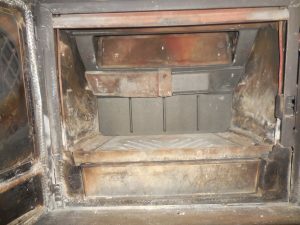 The event is to lay on your back inside the firebox, lift the fireback overhead to mate with an inclined frame and simultaneously get the one bolt on either side engaged with its slot on the frame. After a few tries and then recovering from arm fatigue while eating lunch my prayer for inspiration was answered with two 2×4 blocks. Snugging these into the bottom of the piece while holding it up with the other hand they held it hands-free in place so I could manipulate the bolts into the slots and tighten them up. Glory! Then I realized that I had forgotten to install the gaskets along the edges. I figured there had to be away to get these in above the fireback without removing it, and miraculously I could just slip them in with the bolts loosened. Great. The door air manifold that sits it front of the upper fireback is an engineering marvel to me. 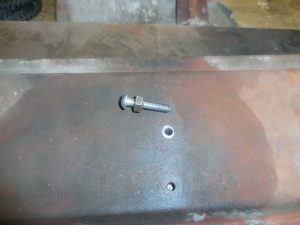 It is held in place with a gasketed slot on its right and one bolt on its left. I installed the gasketing first this time and with a bit of fist banging due to the new gasket on the right got it up into place and bolted it up. Things are looking pretty good here, now. Now I had to figure out how one gets the damper arm to engage with the damper bracket, both of which are out of sight behind the upper fireback and damper. Hmmmm. Finally, working with the damper open (the only way to access the arm and its shaft), I unbolted the damper arm from the vertical shaft, pulled it down and off, then wiggled it around behind the damper until I could feel that it was resting between the ears of the bracket. Then I worked it back up the shaft and re-bolted it. Great, I thought. But now the damper was binding on the head of the SS bolt I used for the shaft pin. Remember that? Inspiration struck in the form of my Dremel tool and a hacksaw blade. I just cut it off, more or less. I was in some sort of yoga position for quite a while. 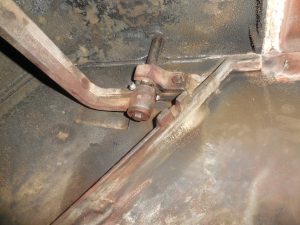 The last step was to run the adjusting bolt into the damper door enough to tighten the damper arm bracket so that when closed and locked the damper was tight against the gasket. In the end it worked “like butter”. The next steps were all routine, or so I thought. I do them every year for maintenance. First up is the lower fireback. I replaced the old edge gaskets. I had left gasket hang down from each side of the upper fireback but realized that it should be trimmed off and glued into the lower FB grooves. OK, no big deal. 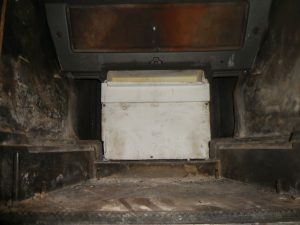 Then you just lean the lower FB up in front of the refractory box, drop the ash grate down in front of it – this baby is the heaviest part – and then tap the throats into place. In putting in the throats, this forces the lower FB into the refractory box to hold everything nice and snug. In the present case this was too snug. First I had trouble getting the lower FB to fit back past the side tabs for the throats. Figured this out but then the old lower FB just didn’t fit back flush with the newly installed upper FB. Gave it some wacks with the heal of my hand that helped. Then I grabbed the rubber mallet. That was a bad idea. See picture. I called the stove shop. They had one in stock. Off I went into the -17°F snowy wonderland and was back in maybe 30 minutes. The new one fit past the throat side tabs easily but the top was still not mating with the bottom of the new upper FB. Wait a minute, maybe the upper FB is a tad too low. Those T-bolts had some play in them. So back in went the wood blocks and I loosened the bolts. I then tapped in the blocks nice and tight and rebolted the upper FB. Presto, magically everything fit. That’s why the old lower FB broke – I was trying to jam it past the bottom of the upper FB. 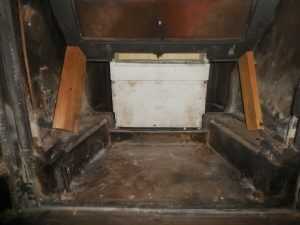 With the lower fireback in place then next things are, in order: install the ash pan and its frame, then install the ash grate; this holds the lower FB in place for installing the throats. And now on to a newly learned trick for installing the throat pieces. 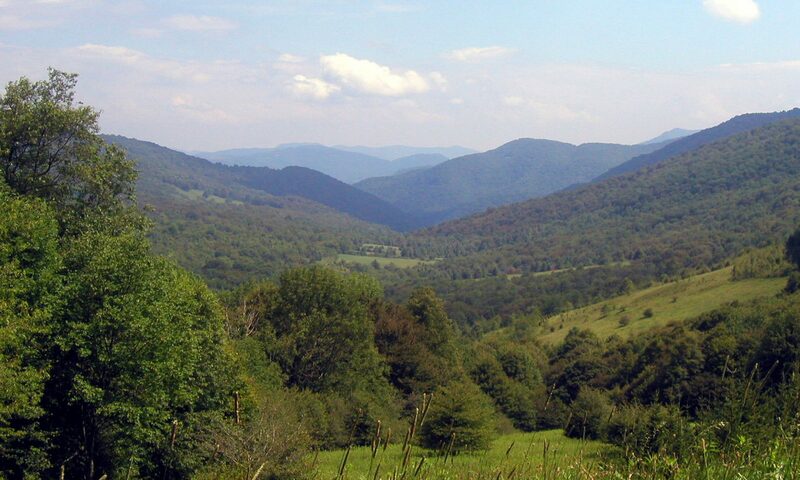 For 30 years I have been holding the loose interior ends of the two throats while at the same time threading the center retaining bracket onto the stud bolt coming out below the damper and screwing the nut onto the stud, and all this by feel only due to the killer angle on my back. Hey here’s a novel idea. Put the retainer bracket on the stud with the nut loosely and then swing the throats one at a time in behind the retainer and then tighten the nut. Simple enough but someone else had to write down for me on YouTube. The other complication, which I already knew, is that the head of the stud no longer keeps it from spinning while I try to tighten the nut on the retainer, so I have to jam a small slotted screwdriver in by the head of the stud to hold it from turning. I plan to glue that in with gasket cement next time. But in the end I got it together. And last of all drop in the ash fettle out front. 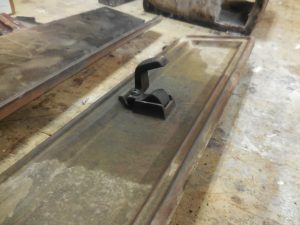 front frame and firebox were mated back together, I had to adjust the door latch back to its original position. So things are back to toasty goodness after hauling three wheelbarrow loads of wood up to the back porch. I had to dig a path to the woodpile. It was under a tarp, but that was buried under about 9″ of snow. Let’s hope this arrangement lasts until we sell the house and move to a condo.